NOTE: In documentation bellow, by clicking on buttons like this , this , this , this , this or this you'll learn more, often important details about theme. THIS DOCUMENTATION ASSUMES YOU ALREADY KNOW HOW TO INSTALL WORDPRESS ON YOUR SITE (DOWNLOAD INSTALLATION, SET UP DATABASE AND RUN SERVER WORDPRESS INSTALLATION), AND HAVE BASIC KNOWLEDGE OF WORDPRESS CONCEPTS, ROUTINES AND TERMINOLOGY. Sequoia theme heavily depends on Aqua Page Builder (AQPB) plugin. Although theme could function properly without plugin (especially blog and standard pages), theme would miss some great features targeted for integration AQPB plugin. Since default WP home page is set to display blog posts, such is the case with Sequoia theme, too. To set home page as in theme demo (with imported content) in Settings > Reading set "Front page displays" to "A static page (select below)" and select imported "Home page". TO INSTALL CHILD THEME, PARENT (MAIN) THEME MUST BE INSTALLED. 3. import XML file from any of three child themes. Navigate to Appearance > Theme options and hit "Save all changes"
If you ignore "Install Plugins", link, the yellow box on the top of the admin pages with required and optional plugins info and installation routines will display notice the start plugins installation. plugins, set "Bulk actions" to "Install" and click "Apply". After plugins are installed, check the same plugins and select "Activate". 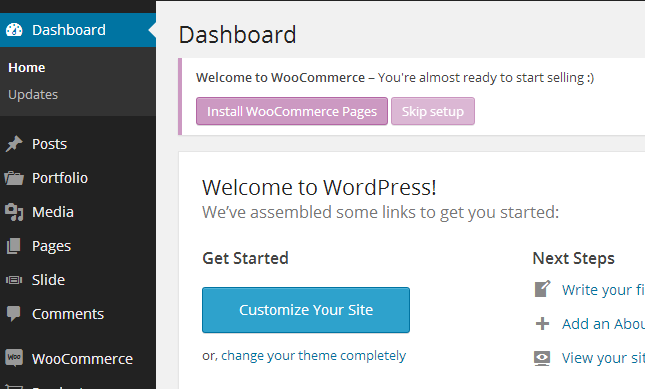 RECOMMENDED: Click on "Install WooCommerce Pages". All the pages for shop will be added and all the endpoints for "My account", "Cart" and "Checkout" will be set in WooCommerce settings . After installing and activating theme and all the plugins related, it's advisable to import demo content to have easier start with a lots of features theme is offering. In WP admin menu go to Tools > Import, and select "Wordpress" from import choices table. If you choose to Import Attachments, please be patient, as the downloading of images may take a while due to some number of quality images to download. It might happen that your server has time or upload limits so the download interrupts or fails, so check your server settings. It's important that after the installing theme, plugins and demo content import the permalinks are set to re-create inner connections between content (posts, taxonomies, meta data...) and create permalink, which are important for SEO. In WP admin menu go to Settings > Permalinks and in "Common Settings" section select "Post name". In "Product permalink base" we recommend setting "Shop base with category" as permalinks base for your shop. If you imported demo content, the menus and menu items will also be imported. However, the import process doesn't manage menus created by import and menus locations, programmed by theme. And learn more about Mega Menus in "Menu locations and mega menu" section. Secondary menu - "Secondary menu"
Theme specific menu feature "Mega menu" is explained in section "Menu locations and mega menu"
Sequoia theme includes the great "Slider Revolution" - a Premium CodeCanyon plugin. Sequoia theme include also sliders used in theme demo, and these files can be found in theme's downloaded package, zipped in "Sliders.zip" file. After installing WooCommerce plugin, you will be able to add products, which are actually custom post type ("product" custom post type). If you imported demo content you'll be able to see that there are set Product categories, Attributes and product tags. There are plenty of settings, options and possibilities you can add to your products and this is all covered in WooCommerce documentation which we highly recommend to use during your e-commerce shop activation. Sequoia theme adds nothing in administering shop or products, all the shop related settings are part of WooCommerce plugin - theme is dealing with products front end presentation (css styling and adapting shop pages layout to theme), especially in Aqua Page Builder custom theme blocks. Administering Aqua Page Builder blocks with products content (and other) is explained in Aqua Page Builder custom theme blocks section. Theme options Shop settings adds additional layer of control over displaying products. For more info, head over to Theme options section. After installing Aligator Custom Post Types plugin your theme installation will have additional custom post type registered - Portfolio. Post formats tabs (above the title) are used to assign post format to the portfolio item (standard, image, gallery, audio, video or quote) - details about Post formats settings (custom meta boxes) are in the section "Post formats"
Portfolio page (or page section) can be created with AQPB plugin - "Ajax content" or "Filtered content" block. AQPB block are explained more detailed in "Aqua/Sequoia Page Builder blocks" section. Posts - use "sticky post" feature - in post "Publish" box - toggle "Visibility" setting and check the "Stick this post to the front page"
Portfolio and slide items - in item edit page, in "Featured" box check the "Make this item featured"
Each of upper post types are using Featured post image - this is the image that represents the content and it is used in archive pages and single pages as bellow post titles and title background, respectively. Sequoia recommended image size is min. 1400px in width. Ideally, the ratio between with / height would be in ratio 1 : 1.618 (golden ratio) - 1400px x 860px in landscape mode or 1400px x 2200px in portrait mode. Additional mage sizes created by theme are - Sequoia portrait and Sequoia landscape. image resolution (the bigger resolution the better quality - but loading time is longer / more bandwidth consumed). Since WP version 3.6 it' very easy to use audio and video with embedded media player. Audio mp3 files can be added with "Add media" pop-up window, in which case for the uploaded audio will be added [audio] shortcode. Audio files added that way will be visible only on posts single page. Sequoia is using video hosting services such as YouTube, Vimeo, Sreenr etc. to add video as featured media using post formats and custom meta boxes. First - select post format video tab, then in custom meta box "Video settings" enter video ID code (not full address of video), and then enter the values of width and heigh of video. To add more video media inside the post content it is recommended to use Aligator Studio Shortcodes (installed in automated theme plugins installation). Assuming the Aligator Studio Shortcodes are installed and activated - click on "Add shortcodes" button, select "Video" and, same as in post format way - choose video host service, enter only video ID code, and then enter the values of width and heigh of video. Blank template - template with no header (with logo and menus) and footer - good for "Landing pages"
As stated before, Sequoia theme heavily relies on AQUA Page Builder plugin - building custom pages with pre packed blocks, using page builder page scaffolding ( grid system ) and many blocks customization options. The base block for Sequoia content - ROW block is the block that holds page scaffolding and where you add other page builder blocks. The ROW BLOCK is built to be used primarily in "Page builder template" - page builder template has different layout - maximally adapted to ROW BLOCK. Titles color - overrides the color default or theme options values for headings inside the row. Link color - overrides link color values. Equalize inner blocks heights - if different amount of content in inner blocks, set heights of each to same value. YouTube video ID - enter YT video id ONLY, not the full address to YT video. Ajax content is using ajax loading of posts, products or portfolio items by selecting it's categories. Post type and categories (taxonomies) must match - post with categories, products with product categories, and portfolio items with portfolio categories. Viewport enter animation - css block animation when enters in the browser view. Total items - total number of items to display - default is 8 if empty it will display max. item number, given the filters above. Ajax products block is displaying products, filtered by product categories, selected via ajax loading. (product) Image gallery pagination, navigation and timing - settings for sliding product images. Banner block can be used for discounts announcements, big notices, and additional attraction to different aspects of your site. Slider block is designed to be used for displaying for post types: Posts, portfolio and products. Slider Revolution block requires Slider Revolution plugin to be installed and activated, and to have at least one slider created, which shortcode can be inserted in Slider Revolution block. Responsive settings - number of items to show for different device widths. NOTE: if horizontal line type is "none", height will apply as blank space. In case of "none" the margin settings won't apply. Some blocks need more vertical spacing between them or simply need to go to new row - so use "Clear block"
Margin - applies to top and bottom margin, NOT left and right. Copy menu to side menu /header - can include existing menu from that location - Main menu location is used. NOTE: same menu as in Ajax Products block, except for ajax loading products, this menu links to product archive pages. Sequoia theme uses Wordpress feature - post formats - to add one more layer of control over content formatting. CUSTOM META - each post type has it's own specific settings, grouped in custom meta boxes and meta fields. NOTE: after import of demo content WP importer doesn't import post formats for PORTFOLIO items, so those will need to be set after the import of demo content. Audio file - upload your mp3 audio file. by clicking on "Video" post format tab the following custom meta box options will appear bellow the main editor. NOTE: Sequoia utilizes video host services to deliver video content, self-hosted video is not supported. With custom meta box settings add featured video, but you can add more videos with use of shortcodes. by clicking on "Gallery" post format tab the following custom meta box options will appear bellow the main editor. by clicking on "Image" post format tab the following custom meta box options will appear bellow the main editor. Use standard "Featured image" (post thumbnail) feature. If the image caption is entered (when uploading image or in "Media" settings). by clicking on "Quote" post format tab the following custom meta box options will appear bellow the main editor. GENERAL CUSTOM META - regardless on whether you are editing post, page, portfolio or slide, there is CUSTOM META BOX "General settings" on the side of the edit page. Those settings are "cross-posts" settings, some can be applied to several post types, some to all. All general settings are explained in the general settings metabox. Any number of menu items, grouped under any menu name can be created, as long as they are assigned to menu locations using "Manage locations" or in "Menu Settings" at the bottom of menu items edit section. Using Main mobile menu is recommended becuase of different layout and resolution of mobile devices. NOTE: item must be "Posts", "Products" or "Portfolio"
In 2nd level item edit box, check the "Post thumb and excerpt" checkbox. In 2nd level item edit box, check the "Clear for row" checkbox. Add more 2nd level section with 3rd level menu items (or mega menu images) after item marked "Clear new row). NOTE: custom fields used for creating Mega menus are also not imported with XML file- you'll need to set those manually. Widgets icons - All the default widgets, WooCommerce widgets and theme widgets have icons representing specific widgets feature or purpose - this is Sequoia specific and will be turned off on theme switch. Display shop title background image ? Single blog page title background image (featured) ? Blog archive title background image ? Blog CATEGORIES/TAGS title background image ? Blog AUTHOR pages title background image ? Show post format icons ? Single portfolio page title background image (featured) ? Portfolio archive/taxonomies title background image ? Sequoia theme is compatible with WPML plugin. Since WPML is third party plugin, please, first get all the info on WMPL setting up and functioning on WPML.org pages. To translate Sequoia strings (words and phrases in theme code), use .po (and .mo) files found in Sequoia's "languages" folder. Wordpress languages files can be found in Your Country WP site and should be add to "wp-content/languages" directory. WP langauge files are mostly usable for default widgets translation. Although Aqua Page Builder is supported for multilingual features (translatable custom post type "Template" we recommend creating separate templates for each language and insert page builder templates in translated pages. or, you can edit appearance in theme options under menu in admin section ( Appearance - Theme Options - Styling Options ). Most of the animation in this site is carried out from the jQuery plugins included in theme and some or executed by customs scripts. Sequoia theme is highly dependable on Aqua Page builder plugin, so it is advisable to install Aqua Page Builder plugin. Slider Revolution plugin (although proclaimed as required) is optional, but we actually highly recommend it. Slider Revolution documentation. We've used the following assets, listed with licencing info. Modernizr / Licenced under BSD and MIT licences. jQuery Waypoints by Caleb Troughton / Dual licensed under the MIT license and GPL license. jQuery Elevate Zoom by Andrew Eades / Dual licensed under the GPL and MIT licenses. jQuery One Page Nav Plugin by Trevor Davis Dual licensed under the GPL and MIT licenses. Bellow listed are image source pages, except for YouTube and Vimeo videos, which are linked to video pages and video author (profile) pages . Once again, thank you very much for purchasing this theme. We would be glad to help you if you have any questions relating to this theme. No guarantees, but we'll do our best to assist.